CS Handrails deliver on safety, functionality and style and are highly suitable for both contemporary and traditional interiors. CS handrails are available in a range of colours and finishes, from the simple Acrovyn handrail, to the sustainable timber handrail with stainless steel accessories. 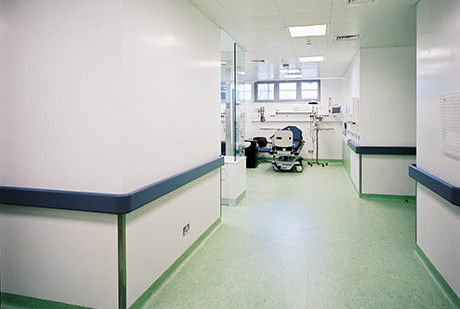 All CS handrails are suitable for public environments. PLEASE NOTE: minimum order quantities apply, please enquire. Take a look to see what we are capable of. Our handrail experts have a wealth of experience with many types of commercial projects throughout Western Australia. Here are just a couple to give you an idea. Pedestrian support combined with impact protection! Acrovyn handrails are available in numerous designs and can be combined with crash rails. A combined system handrail / crashrail system can offer pedestrian support along with severe duty impact protection. 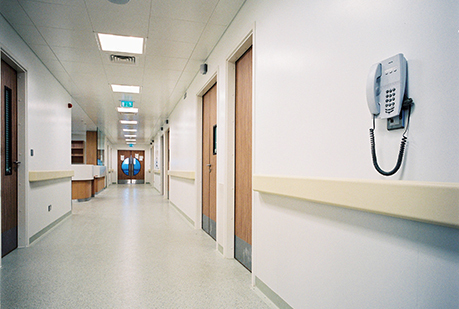 The ability to choose from a wide selection of colours or colour combinations, makes it easy to specify a handrail system that suits specific project requirements. A 158mm high handrail, featuring an integrated Acrovyn crash rail with continuous shock absorbing bumper. 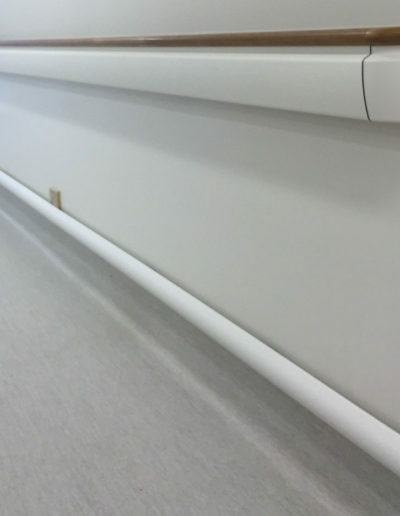 The HRB-10CN Hand rail offers numerous design options allowing designers to integrate up to three different colourways in each handrail. Available with a psychiatric bracket enclosure to ensure patient safety. Our most popular Acrovyn® combined handrail & crashrail offering robust pedestrian support and severe duty impact protection. 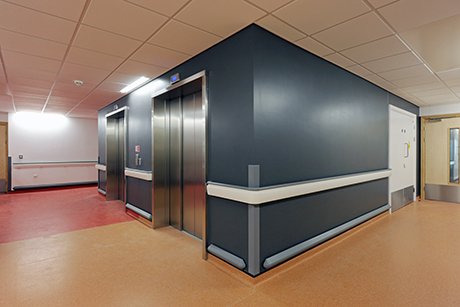 The HRB-20N series allows designers to use two different Acrovyn® colours to provide essential visual contrast between the handrail and the crashrail. The impact resistant Acrovyn® cover and shock absorbing bumper allow the HRB-20N to withstand the heaviest of knocks from hospital beds, trolleys and wheelchairs. The original Acrovyn® hand/crashrail, offering a classic, flat profile aesthetic. The HRB-4CN features a single piece, impact resistant Acrovyn® cover which flexes on impact, allowing it to withstand heavy impact. The flat, easy to clean Acrovyn® surface makes it perfect for busy public areas. Shock-absorbing bumper cushion for increased impact protection. The HR-6CN is the latest addition to our handrail range, offering pedestrian support in an environmentally friendly profile. The 40mm Ø handrail features Acrovyn® 4000, PVC-Free cover over aluminium retainer and is mounted on stainless steel brackets. Combined 38mm handrail and 89mm deep curved crash rail featuring an impact resistant Acrovyn® cover. Available in 40 colours the HRB-35N hand/crashrail will complement any design. Featuring Rapid Fix brackets, the HRB-35N can be installed quickly and efficiently, whilst also being easy to remove for access to the wall behind. Pedestrian support with wood & stainless steel! The Renaissance range offers a stylish wooden and stainless steel finish providing a natural, modern look whilst offering pedestrian support in public areas. Ideal for both modern and traditional interiors. The solid wood handrail with AW-10CVB or without AW-10C protective accent bumper offers a warm, secure feeling. Available in a variety of standard and custom wood species and finishes. Quick Lock brackets simplify installation. The HRBW-10CN hand and crash rail offers exceptional wall protection combined with the warmth of a round wooden handrail. The shock absorbing crash rail portion features an internal bumper cushion for added protection. The horizontal accent reveal can coordinate or contrast. 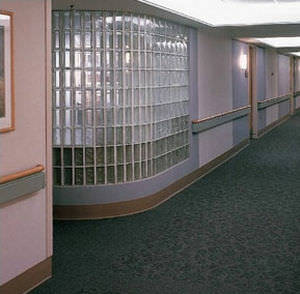 The HRBW-20N hand and crash rail features aesthetics and protection in one railing. The oval handrail portion of the HRBW-20N is available in a variety of woods and the crash rail portion in solid colours or chameleon patterns. This handrail offers designers a host of aesthetic options including a solid wood face (HRW-10C), a face with finished grooves (HRW-10CG) or a face with accent inserts (HRW-10CV). Optional Quick Lock bracket available. The sleek HRWS-6C handrail combines the warmth of wood with stainless steel end caps and brackets for maximum aesthetics. The stainless steel end caps, brackets and optional splices can be powder coated. Wooden end caps are also available. High performance pedestrian support & wall protection! A collection of robust, high performance handrails, suitable for a broad range of health, public and commercial interiors. P-OWM is a 153mm high rail combining an oval wood handrail with a 102mm powder coated aluminium crash rail. The 162mm high P-RWM features a round wood handrail with a 102mm powder coated aluminium crash rail. An updated version of our HRW-10CV, the P-OWWV is comprised of an oval wood handrail attached to a wood crash rail with vinyl inserts. 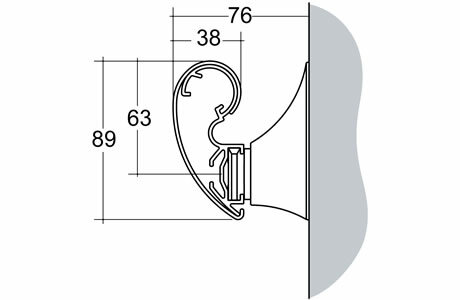 This profile is also available with a grooved (P-OWWG) or plain face (P-OWW) crash rail. This profile option features a stainless steel crash rail that’s combined with a round (P-RASN) or oval (P-OASN) Acrovyn handrail. Both rails are attached to a dual cantilevered bracket. The bracket component can be powder coated. This railing combines the durability of a round, Acrovyn handrail with a classic wood crash rail. The classic wood crash rail is available with accent inserts (P-RAWVN), finished grooves (P-RAWGN) or a plain face (P-RAWN). P-RS is a single round stainless steel handrail 150mm high and P-OM is an oval metal handrail 140mm high with powder coat. A round stainless steel handrail combined with a variety of crash rail options (stainless P-RSS, Acrovyn P-RSAN, aluminium P-RSM & wood P-RSW). The wood crash rail also available with accent inserts (P-RSWV) or finished grooves (P-RSWG). Components are attached to dual cantilevered brackets. All metal components available in several powder coat finishes. This profile option features a stainless steel crash rail that’s combined with a round (P-RWS) or oval (P-OWS) wood handrail. Both rails are attached to a dual cantilevered bracket. The bracket component can be powder coated. An updated version of our HRW-10CV, the P-RWWV is comprised of a round wood handrail attached to a wood crash rail with accent inserts. 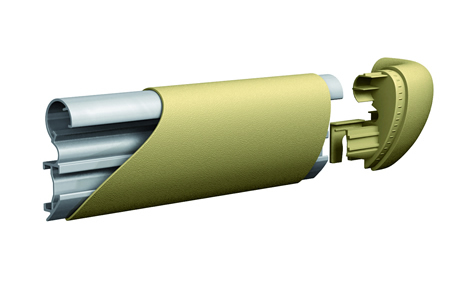 This profile is also available with a grooved (P-RWWG) or plain face (P-RWW) crash rail. This new Acrovyn handrail and crash rail combination works as good as it looks. The P-OAAN oval handrail and 102mm high crash rail are attached to a dual cantilevered bracket. Model P-RAAN features a round handrail. Combine the practicality of an Acrovyn handrail with the sleekness of our 102mm aluminium crash rail. Specify P-OAMN for an oval handrail or P-RAMN for a round handrail. This single line wood handrail is attached to a single cantilevered bracket. Metal components available in 8 powder coat finishes. P-OW features an oval handrail and P-RW features a round one. This handrail combines the durability of an oval, Acrovyn handrail with a classic wood crash rail. The classic wood crash rail is available with accent inserts (P-OAWVN), finished grooves (P-OAWGN) or a plain face (P-OAWN). The P-OMS handrail features a stainless steel crash rail that’s combined with an aluminium handrail. The aluminium handrail can also be combined with an aluminium crash rail. (P-OMM). Both rails are attached to a dual cantilevered bracket. Metal components can also be powder coated. This profile combines an oval aluminium handrail with a wood crash rail. The handrail is offered in several powder coat finishes. The wood is offered in a variety of standard and custom wood species and finishes, and it’s available with vinyl inserts (P-OMWV), finished grooves (P-OMWG) or a smooth face (P-OMW). The shock absorbing Acrovyn crash rail of model P-OWAN protects not only the wall behind it, but also the oval wood handrail above it. Model P-RWAN features a round wood handrail and model P-OMAN features an oval metal handrail.